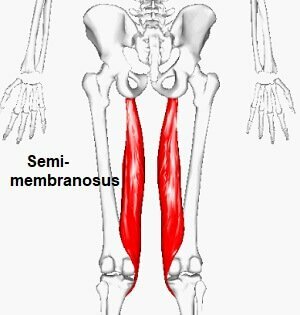 The semimembranosus muscle is the deepest and inner most of the hamstring muscles, found on the inner (medial) side of the back of the thigh. It runs almost directly below one of the other hamstring muscles, semitendinosus. It originates from the upper lateral facet on the ischial tuberosity (part of the pelvis) attaching to it via a strong tendon. Fleshy muscles fibres run downwards and slightly medially underneath semitendinosus and biceps femoris. Just above the knee joint, the muscle narrows into an aponeurotic (flat and broad) tendon which attaches to a small, horizontal grove on the posteromedial surface of the medial tibial condyle. Some fibres also blend with the medial collateral ligament, found on the inner side of the knee. Other fibres pass upwards and laterally to form the oblique popliteal ligament which attaches to the posterolateral femoral condyle. Semimembranosus is separated from the gastrocnemius calf muscle and the tibia via a bursa (small fluid filled sac) to reduce friction. 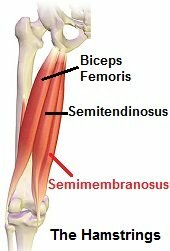 The primary function of semimembranosus and the other two hamstring muscles is to bend the knee, e.g. when stepping over an object. They can also work to move the hip and when the trunk (back) is bent forwards e.g. when reaching down to pick something off the ground, the hamstrings work to extend the hip joint to help you come up to standing. Another example with this is at the start of a sprint race where the hamstrings are particularly active in the initial push off and first 10-20m of acceleration. Here, the hamstrings work eccentrically, meaning they lengthen rather than contract), whilst being loaded, to produce speed, making them prone to injury. When the knee is slightly bent (semi-flexed), the hamstrings can medially rotate the knee. The hamstring work together functionally with movements such as jumping, squatting, running and standing up from sitting. The also help to control knee movements such as slowing the speed at which your leg swings forwards when walking, working like brakes.